If you’re a frugal, candle-burning lover like myself, you’re probably obsessed with Bath and Body Works candles or Yankee Candles. Am I right? And you’ve probably wondered what to do with the leftover candle wax and jar after it burns out. 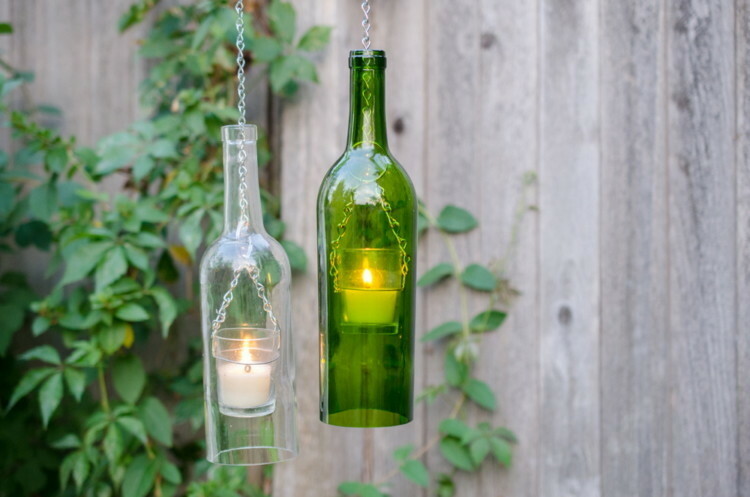 Turns out, there’s a ton of ways to reuse not only the candle wax, but the jars as well. First, remove candle wax from the jar. 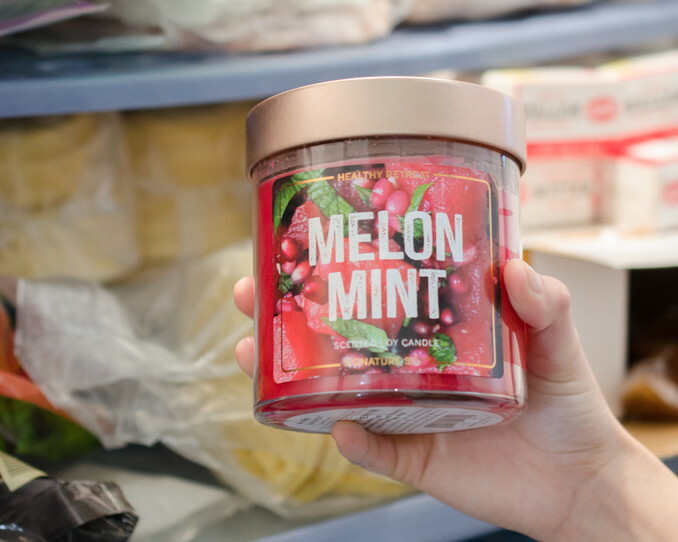 Place your candle in the freezer for at least an hour — but you can leave it in much longer if you forget. Once it’s completely frozen, use a dull knife to stab the wax, and it should break apart in chunks. Cut several slits into the hard wax, then pour boiling water into the jar — leaving a few inches of space on the top. Allow the hot water to sit for an hour. The wax will melt and float to the surface of the jar. Once it’s reached the surface, the wax will harden again as the water cools down. You can easily grab the wax with your hand. Always use caution when pouring boiling water into glass. Thick glass is better for this method. Some thinner glasses might not be able to withstand the temperature of the boiling water and will shatter. Place your candle into a bowl or pot, and pour boiling water into the pot or bowl until it almost reaches the top of the candle. The hot water bath will cause the wax to melt. Once the wax melts, grab it with your hands and set aside. 1. 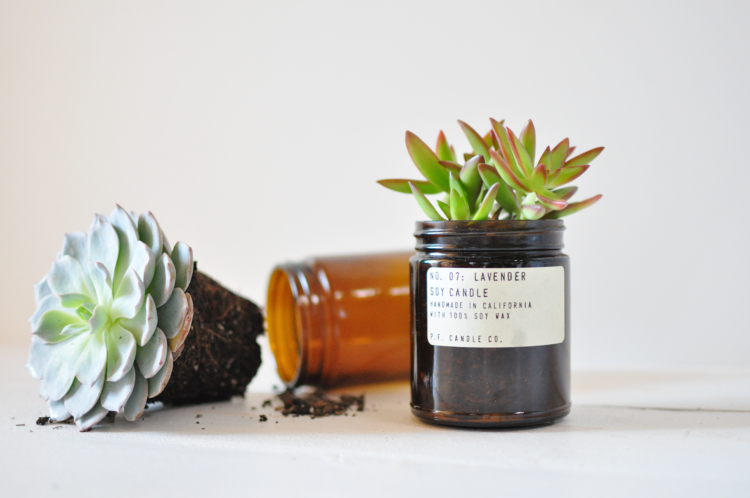 Plant succulents in an old candle jar. 2. Make fire starters for camping or a wood burning fireplace. 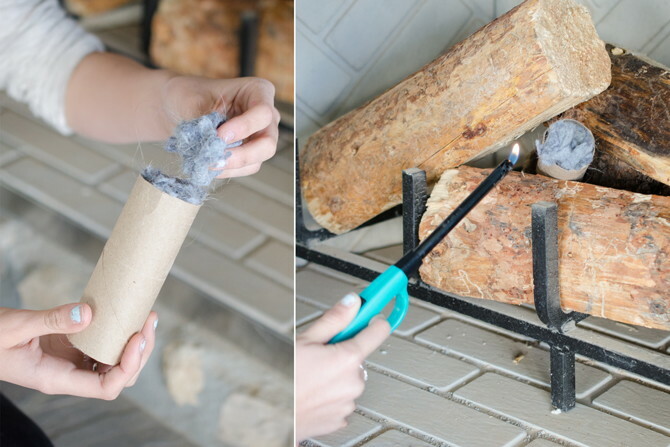 Use leftover candle wax, an empty egg carton or toilet paper tube, and either cotton pads or lint to make fire starters. To make cotton-pad fire starters, first melt old candle wax on low heat. Hold on to an edge of the pad and dip into the wax. Set aside and let the wax harden. To use, light the unwaxed edge of the cotton pad. Another method is to use a cardboard egg carton and fill each cup with dryer lint. Melt leftover wax then pour into each cup, soaking the lint. After the wax hardens, cut apart the cardboard cups: you’ll have 12 to 18 fire starters. If using toilet paper tubes, stand upright and stuff half full with lint. Pour in a small amount of wax, and add more lint on top. With either fire starter, simply light to use. 3. Create magic ink for your kids. 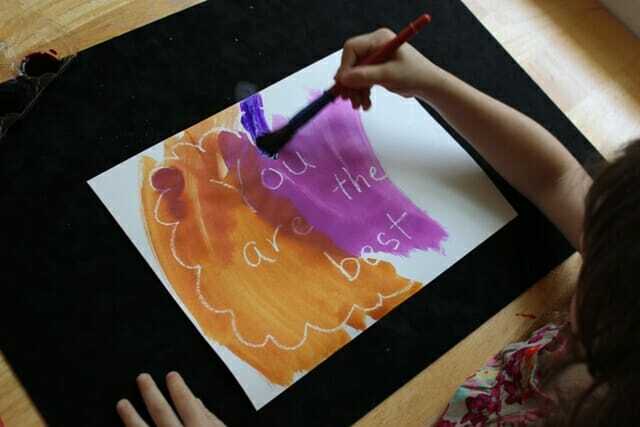 Let your kids draw messages on paper with white candle wax. The message will remain invisible until they either pour cool coffee over the paper or paint over it. 4. 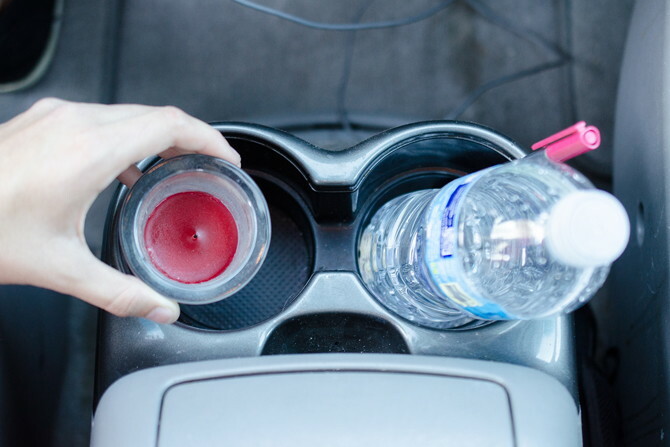 Use old candle wax as a car air freshener. 5. 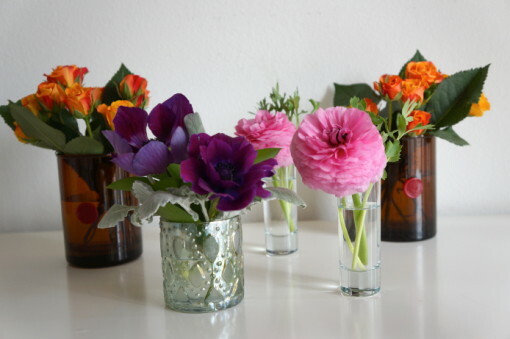 Reuse a candle jar as a flower vase. 6. Make hanging hurricane lamps. Consolidate all the unused candle wax that you can to make hanging hurricane lamps. 13. 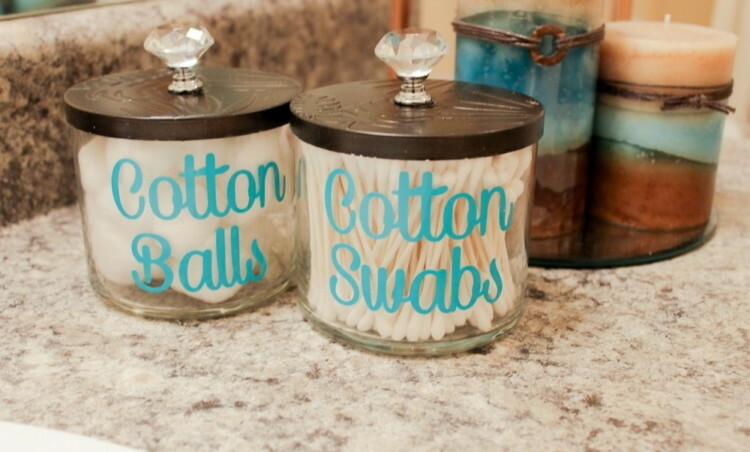 Store bathroom supplies like cotton balls or Q-Tips in old candle jars. 14. Waterproof a return address, shipping labels and recipe cards with white candle wax. 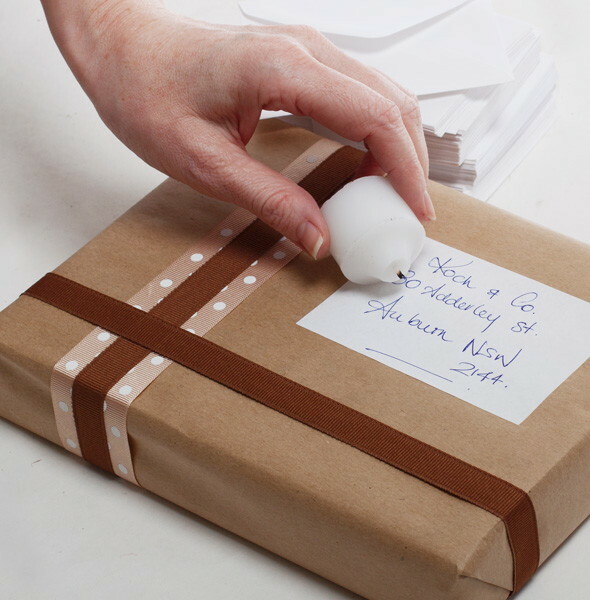 Rub white candle wax over a return address, shipping label or recipe card to waterproof them. Since it’s white candle wax, you’ll still be able to see through it. 15. 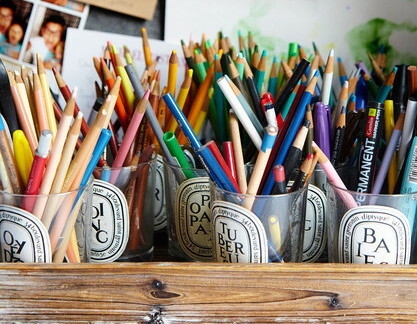 Fill an old candle jar with crafting supplies. 16. 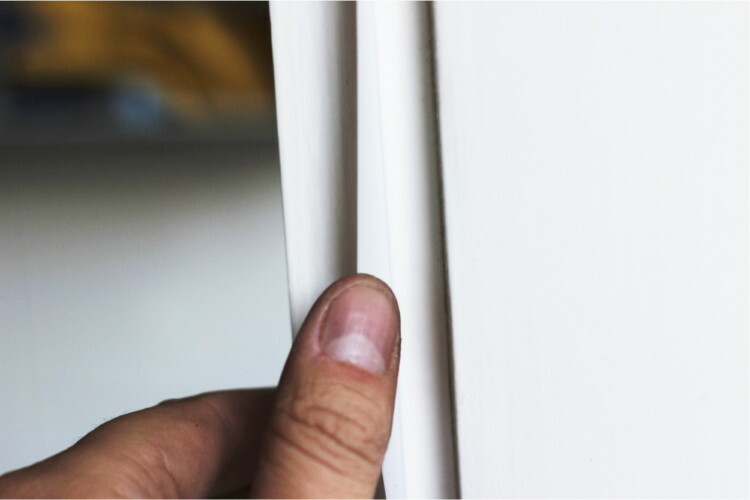 Use white candle wax in place of caulk to seal drafty windows. Let the old candle wax act as a barrier to keep drafts at bay. 17. 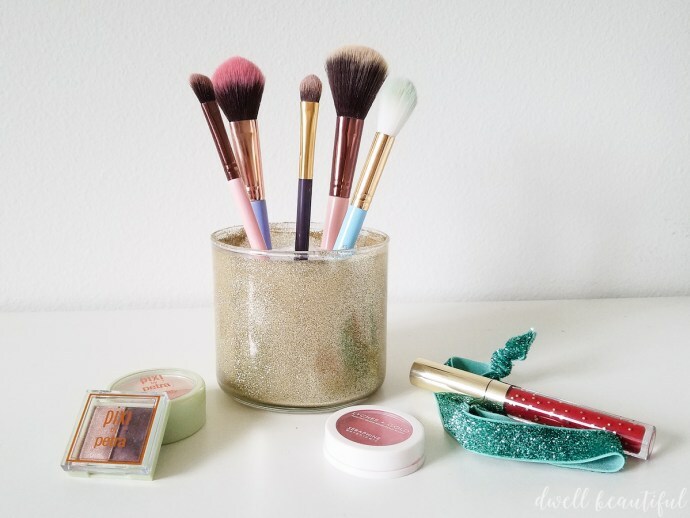 Store makeup brushes in old candle jars. 18. 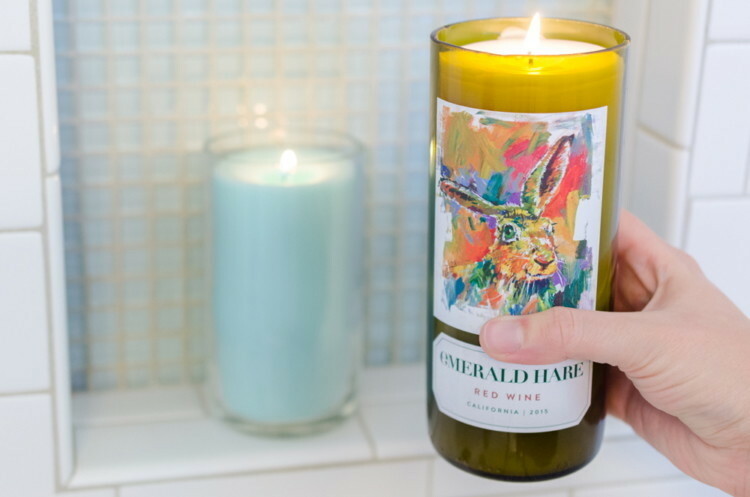 Turn your favorite wine bottle into a candle. Gather up old candle wax from around the house. As you melt the wax, do the following: use a drop of glue or a glue dot to adhere the wick tab to the bottom of your bottle. Keep the wick taut and centered by wrapping it around a set of chopsticks and resting them across the bottle. Remove melted wax from the heat, and allow it to cool slightly before adding adding essential oils or a scent of your choice. (Adding the scent while still on the stove can cause it to evaporate out of the wax.) Pour wax into the bottle. Leave the candle to cool at room temperature for 24 hours. 19. 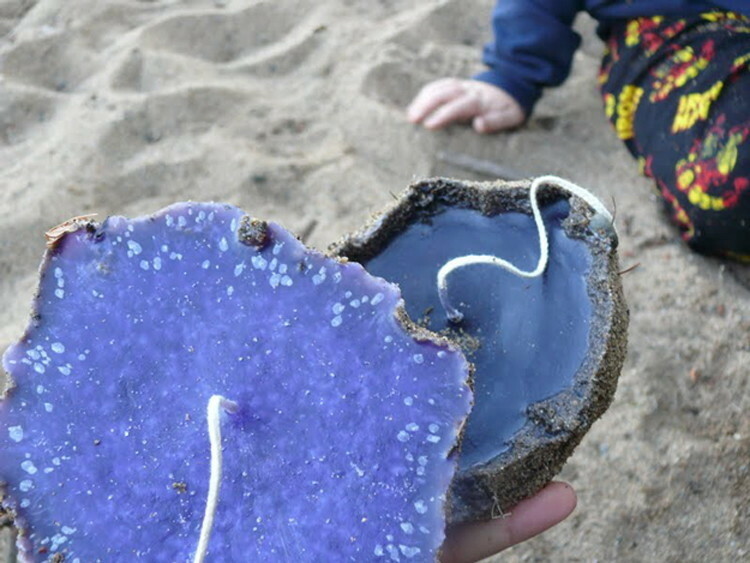 Keep kids entertained by making easy sand candles. Dig a hole in damp sand. Tie a candle wick onto a stick that can span across the hole. Pour melted candle wax in into the hole. Allow the wax to set for a few hours before digging up your candle, and voila! Your kids will be amazed!